If you're a fan of ABC's popular Friday-night TV show "Shark Tank," you've probably watched dozens of inventors pitch their strange ideas, begging for backers. Aspiring entrepreneurs have to have thick skin. More than half of the people who show up never strike a deal, are sometimes insulted and laughed off stage by the five super rich investors, known as "The Sharks." "The Sharks" decide right then and there whether they'd like to invest their own money in exchange for equity in the business. So, after "The Sharks" agree to help a company, is it worth the humiliation? Aaron Krause got shark Lori Greiner to back his company "Scrub Daddy," which makes sponges. In an interview with ABC News Chief Business and Economics Correspondent Rebecca Jarvis, who also hosts the hit digital show "Real Biz," Krause said it was a miracle to be accepted on "Shark Tank." "The night the show aired, there was 30,000 hits to our website. Instantly you have a name brand and you have to be ready and prepared when they happens," Krause said. Since its inception, the scratch-free, sponge with a smiling face has struggled for sales, earning $100,000 in 18-months, mostly from QVC. 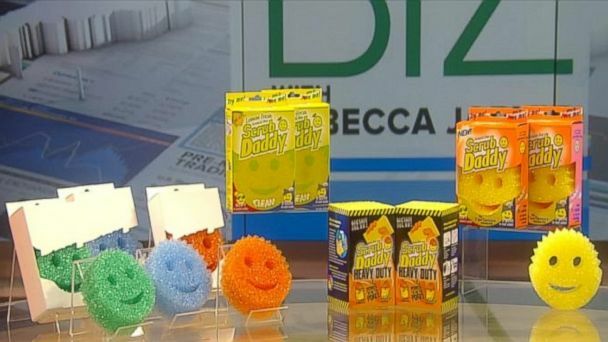 After "Shark Tank" aired, Scrub Daddy's sponge soaked up sales earning $18 million in the same time frame. Krause said he couldn't believe the traction. "Even $1 million would have seemed like a dream come true," he said, noting that Scrub Daddy is now sold in Wal-Mart, Bed Bath & Beyond and SuperValu. He's also striking deals with other retailers. So how did the cutest sponge you'll ever own squeeze its way into the mainstream market? ABC News caught up with Krause during his visit to "Real Biz with Rebecca Jarvis." And Krause said it was all an accident. After damaging a car at his day job washing and waxing cars, Krause invented a line of buffing and polishing pads, which were later bought out by 3M in August 2008. 3M didn't need Krause's sponges because they have their own brand, Scotch-Brite. So Krause sold his business and stuffed his useless sponges in the back of his factory. In a stroke of luck, his wife, Stephanie, makes him do the dishes after she cooks. And after a long day of spring cleaning five years after he sold his business, Krause said he used one of his old sponges to do the dishes. That's when Krause realized his multi-million dollar idea had been collecting dust for years. Scrub Daddy, the cutest yellow sponge ever was born. Not only does it make you happy when you look at it, there's science behind the brand. It's made of a high-tech polymer, strong enough to clean a grill. Its texture changes with the water temperature - hard for cold, soft for hot. Krause also said it is more sustainable and smells better than other competing brands that collect bacteria. "This special material has also been independently lab tested to not retain odors for up to two months while being safe to use on just about every household surface," he said. Krause has two patents on the design of the sponges but noted that "patents are not the end all, be all." "Once you get a patent, you open yourself up to competition because you disclose to entire world how you make it and what it's made of," he said. His advice for fellow entrepreneurs: "Lock down the intellectual property, invent a new process for making the product and then guard your trade secret with your life."